She Owes Her Activism To A Brave Mom, The ADA And Chocolate Cake : Goats and Soda Born deaf and blind to a refugee mother, Haben Girma has had opportunities in the U.S. she'd never have had in Eritrea. But it was an urge for dessert that led her to advocate for the disabled. Using a digital device that displays Braille characters, Haben Girma talks with President Obama at a White House ceremony marking the 25th anniversary of the Americans with Disabilities Act. It's easy to understand why the grandmother feels that way. Years before, she had tried to find a school in Eritrea for Girma's older brother, who was also born deaf and blind. She was turned away. There were schools for blind children and schools for deaf children. But no school would teach a child who was deaf-blind (that's the preferred terminology in the disability community). Girma describes that brother as "brilliant." By the time Girma was born in 1988, six years younger than her brother, her mother had made a refugee's journey from Eritrea to the United States. And in California, a deaf-blind girl like Girma had a legal right to an education. In an interview with NPR, Girma — who turned 27 on Wednesday — explained more about the family's journey. In the winter of 1983, Girma's mother, Saba Gebreyesus, left Eritrea. The war of independence with Ethiopia was going on. It was a two-week trek to Sudan, "walking at night to try to avoid the different military groups fighting in that area." At one point she slept in a tree surrounded by hungry hyenas. In the United States, disability civil rights laws provided opportunities to Girma. The IDEA law says every child with a disability is guaranteed an education, and the ADA bans discrimination based on disability. At Lewis & Clark College in Portland, Ore., Girma at first would walk up to a food station in the cafeteria and put out her plate. She'd eat whatever she was given. Sometimes she liked it, other times not. She wanted choice. ("What if there was chocolate cake at Station Four?" she says.) So the food service manager agreed to email the day's menu, which she could print on a Braille reader. But the menu came infrequently; food service managers said they were too busy. Girma was reluctant to demand more. Mainly because it seemed trivial to complain about missing out on chocolate cake — or even getting a meal she liked — given her family's own hard life in East Africa. 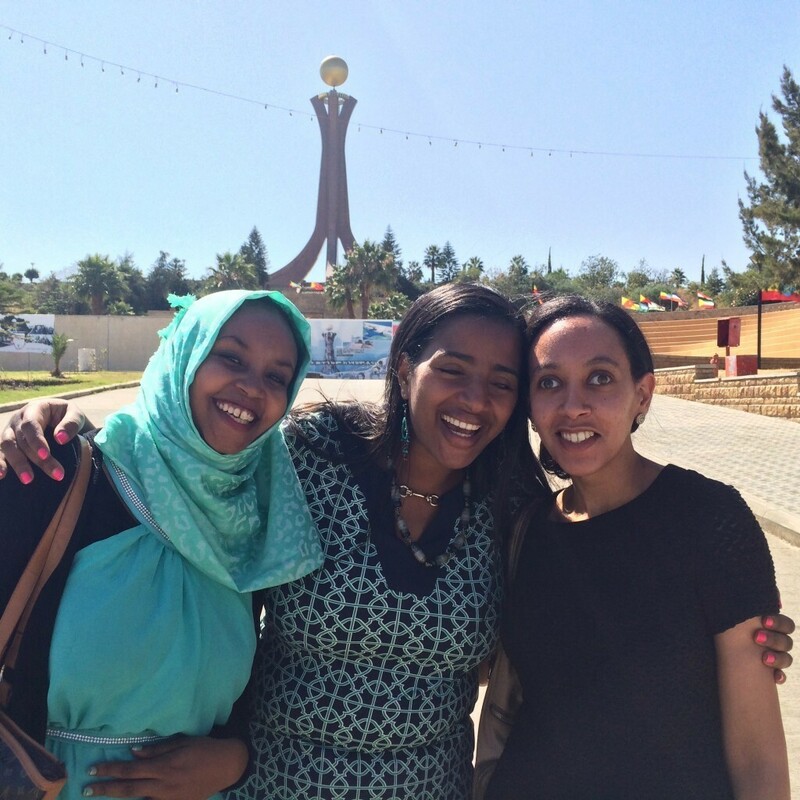 Haben Girma (right) and friends at the Martyrs Memorial in Mekele, Ethiopia, honoring those who died in the country's civil war. "I'd grown up hearing stories about the war in Eritrea, limited resources, people struggling to survive," she says. In the U.S., she was living a good life, going to college classes, drinking hot chocolate at Starbucks. "It was hard for me to make a fuss about access to cafeteria menus. At the same time, I realized after months of not getting access that if I didn't do anything, other students with disabilities would face a similar barrier." She told cafeteria managers about their obligation to make a "reasonable accommodation" under the ADA. "Then their attitude changed and they started providing me greater access to the menu," she says. "And the next year, when another blind student came to the school, that student was able to benefit." One result of the cafeteria experience is that Girma saw the importance of enforcing civil rights laws. She went to Harvard Law School, graduating in 2013. (At Harvard, she also competed on the Harvard Ballroom Dance Team.) Since then, she has worked at Disability Rights Advocates, a California-based disability civil rights law firm. At the White House, Girma talked to the president one on one, telling him "that technology can bridge the gap for people with disabilities." The president typed on a silver, wireless keyboard, and Girma read the message on a digital Braille device (the technology that enabled us to conduct our phone interview with her). The back-and-forth was instantaneous. There's a video of Obama's conversation with Girma, and with another woman with a disability, Alice Wong, who didn't attend the White House ceremony in person but spoke to the president through a robotic webcam that Wong could control and move. A few days later, Girma again was stressing the importance of accessible technology in a talk at Google that she called "Bringing Helen Keller to Silicon Valley: Designing Technology with Accessibility in Mind." "Digital information is just ones and zeroes," she says. "It can be converted into any kind of format. And those people who develop these services — programmers, technology designers — they have an incredible power to increase access for people with disabilities. And I hope they use it." Girma has taken her advocacy around the world. She has talked about technology and attitudes toward disability on trips to China, Costa Rica and Ethiopia. "Many cultures, including Ethiopian culture, view disability as a curse on the family," she explains. "Advocates around the world are working to change such attitudes, and I help as best I can." As for her deaf-blind brother, who couldn't go to school in Eritrea, American civil rights laws changed things for him, too. "He started to get an education finally at age 12," she says. In the Oakland schools, teachers "taught him Braille, and he also had to learn English and American Sign Language. And after that, his education just took off." Today, her brother, Mussie Gebre, travels around California, teaching people with disabilities how to use technology — like the devices that help him and his sister. "To all of us here," Girma said to the crowd in the East Room at the White House, "we know that people with disabilities succeed not by magic but from the opportunities afforded by America and the hard-won power of the ADA."